Moreover, the internet has put celebrities closer to their fans, making them feel more accessible. When these two things combine, it can result in some amazing fan art. Below is a showcase of some stunning examples of celebrity fan art. This digital painting looks almost like a photograph, but the really impressive part is how the artist has captured Carrell’s trademark comedic style, where he makes us sympathise with his character as we laugh at him. 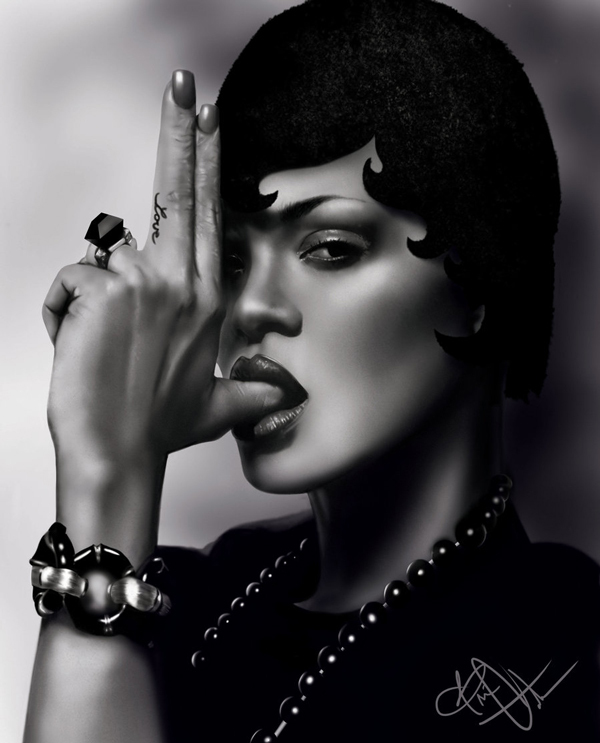 Rihanna has had many looks over her career, and this digital painting captures her current incarnation. She looks hardened, but she never loses a softness and femininity that allows her to seem approachable. This digital portrait takes a surreal approach to fan art, without looking amateurish. Portman’s hair melts into inkblots while the bouquet she holds seems to explode from her, creating a dynamic quality that contrasts with the calm yet intense expression on her face. Morgan Freeman is associated with the wise, nurturing grandparents we all wish we had. No wonder he always plays God on film. This digital painting captures his innate warmth and radiance perfectly. This digital portrait takes a slightly different approach. The artist has turned House into a cartoon character, which really is appropriate, given the nature of the character. It plays up the humour Hugh Laurie brings to the role, whilst also underlining the character’s pessimism. This digital portrait also depicts a famous character, but it almost does the reverse of the one above. Jack Sparrow scowls at the viewer, giving a sense of the darkness and depth that Depp gave the character. This digital portrait doesn’t reflect Saldana’s personality as much as the other portraits do with their subjects. Instead, it almost seems to imagine what Andy Warhol would be doing if he were still doing his Pop Art thing today. The first portrait in this showcase that is a photograph of a real work, this portrait of Lemmy is acrylic on canvas. It is rough, worn, totally hard-core, full of pride and nonetheless a little dignified, just like the subject himself. Kurt Russell is a favourite of the artist, who used pencil and gouache on an unknown base to depict Stuntman Mike from Quentin Tarantino’s Death Proof. The sunny background contrasts with the murderous character to a chilling effect. Despite what you may think of the subject, you’ll find it hard to argue that this portrait is not impressive. Using graphite on Bristol paper, the artist captured the mysteriousness of the character so accurately that it is hard to pull your eyes away from the subject’s. Not every piece of fan art is amazing, as the ones below demonstrate. Using oil on canvas, the artist reimagined Kylie Minogue as manga character Sailor Moon. That is unsettling enough, but the odd angles on Minogue’s face and shoulders really pushes it into the arena of creepy portraits. This is just about the polar opposite of the fan art above. This pencil on paper drawing depicts Robert Pattison, but his face seems too small and weirdly off-set on his head. This digital portrait of Whoopi Goldberg as the archetypal Great Mother really takes the crazy cake. Whoopi Goldberg as a venerated figure is odd enough, but replacing the baby Jesus’s head with a blueberry is simply inexplicable. Neeru Pallen writes on behalf of an online ink company, Click inks. As a writer Neeru has blogged extensively about design resources. She has been a marketer, writer and blogger for 2 years. She specializes in content creation and design. All of them are great, but I personally find this one fascinating – Morgan Freeman by ~Tolio-Design. Great work mate.